Taiwan Watches Anxiously As President Trump Begins His China Visit : Parallels While Taiwan's government officials and experts put on a brave face, their anxiety is palpable. It stems from President Trump's unpredictable style and apparent preference for short-term deal-making. 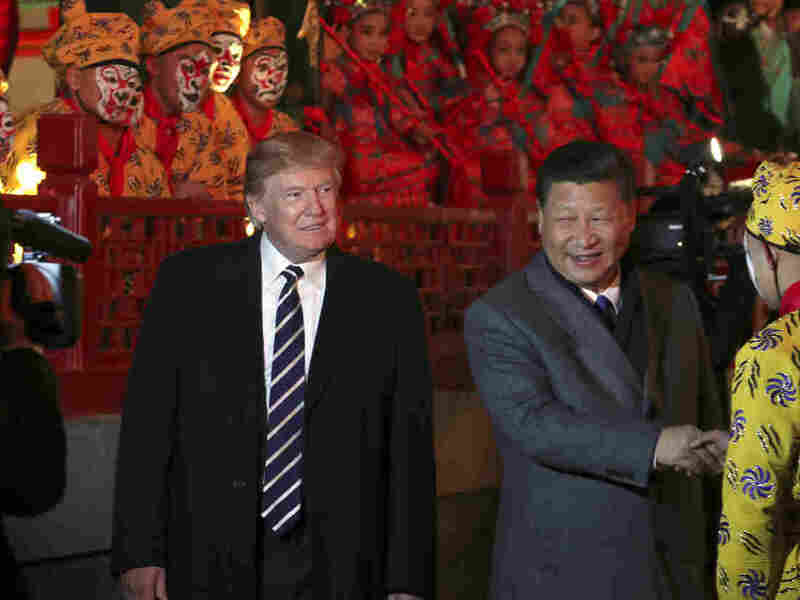 President Trump and Chinese President Xi Jinping arrive to watch an opera performance at the Forbidden City on Wednesday in Beijing. After stops in Japan and South Korea, President Trump arrived in China on Wednesday, the third of his five stops in Asia this week. He had tea and dinner, and took in some opera, with China's leader Xi Jinping. On Thursday, they will hold bilateral talks. On the table will be the trade imbalance between the countries that Trump hopes to rectify and ongoing provocations from China's intransigent neighbor, North Korea. Even as the world — especially Asian nations — looks on, no one is watching this leg of Trump's swing through Asia with more trepidation than Taiwan. 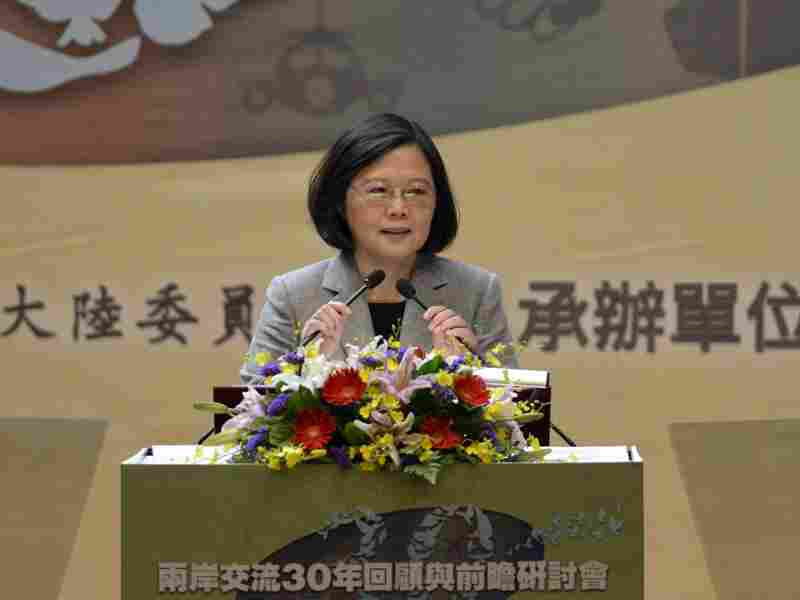 Taiwan's President Tsai Ing-wen speaks at a conference on Taiwan-China relations organized by Taiwan's Mainland Affairs Council in Taipei on Oct. 26. Tsai said there was an "opportunity for change" and called for dialogue with Chinese leader Xi Jinping. While government officials and experts in Taipei put on a brave face, their anxiety is palpable. It stems from Trump's unpredictable style and apparent preference for short-term deal-making over long-term strategic considerations. "President Trump is very well-known for his transactional style of policymaking," says Szu-chien Hsu, president of the Taiwan Foundation for Democracy, a government-run think tank. "We have this fear that he can be shortsighted." Beijing, which hopes to reunify with Taiwan one day, regards Taiwan as a renegade province. The United States, under its "One China" policy, acknowledges that Taiwan is part of China and has no official ties with it. Over the past four decades, however, Taiwan has grown to become the U.S.'s 10th-largest trading partner. The U.S. also continues to sell Taiwan advanced weapons. In Trump's desperation for a deal with China on trade or North Korea, Hsu fears the president will accept terms that may be detrimental to Taiwan's security and long-term interests. Trump hinted that he might consider the "One China" policy as a bargaining tool, speaking on Fox News Sunday last year after he took a congratulatory call from Taiwan's President Tsai Ing-wen soon after his election win. "I fully understand the One China policy," he said, "but I don't know why we have to be bound by a One China policy unless we make a deal with China having to do with other things, including trade." The call between the two leaders made headlines around the world. No U.S. leader had spoken to their Taiwanese counterpart since the U.S. switched diplomatic recognition from Taipei to Beijing in 1979. Now, says Hsu, the best thing would be for Taiwan to not come up as a topic of discussion at all. "On this trip, as long as [Trump] doesn't mention Taiwan or if the Taiwan issue is not mentioned, that's good enough," he says. Daniel Russel, a former assistant secretary of East Asian and Pacific Affairs and now a senior fellow at the Asia Society Policy Institute, says the Taiwanese are "understandably worried ... and some may fear that if President Trump hasn't mastered the subtleties of cross-strait relations, he could be coaxed into agreeing to something that undermines Taiwan's interests." Washington plays a pivotal role in maintaining Taiwan's sovereignty. Though its relations are unofficial, the U.S. helps Taiwan's defensive capability and works to "discourage any effort to unilaterally change the status quo, and support the peaceful resolution of differences between Taipei and Beijing," Russel says. If that commitment were to be taken away or altered, one can start to understand the nervousness of the Taiwanese. Hsiao-Yueh Chang heads Taiwan's Mainland Affairs Council, which formulates and implements policies relating to China. She's had a relatively quiet year – China suspended talks with Taiwan after Tsai's inauguration as president in May 2016. Tsai's party has been traditionally pro-independence, though she has been very cautious since taking office. "I don't think the U.S. will use Taiwan as a bargaining chip when talking about North Korea," says Chang. But she adds that her group has had a busy past few months, "reminding, keep reminding the U.S. government not to use Taiwan as a bargaining chip." While Trump's unpredictability may be one reason for Taiwan's anxiety, another is Chinese leader Xi Jinping, who, after the recently concluded 19th Party Congress, has emerged as the most powerful and confident Chinese leader in decades. "Because of Xi's elevation and strong leadership, the pressure continues," says Taiwan's Foreign Minister David Tawei Lee. "For us to remain free and democratic, we need not just U.S. arms sales but also moral support. We need it to allow us some international space." China has been successfully denying Taiwan that space. It has frozen out Taiwan from international bodies like the World Health Organization and managed to lean on two more countries this year to formally sever ties; only 20 countries in the world now officially recognize Taiwan. Foreign Minister Lee firmly believes that Taiwan shares a "special relationship with the U.S." and hopes that Trump will tell the Chinese leader "no coercion, no pushing," when it comes to the mainland's dealings with Taiwan. He also hopes that talks resume between China and Taiwan and that people-to-people contacts continue – though Chinese tourism to Taiwan has fallen dramatically over the past year – and economic ties will strengthen between the two. Nishant Dahiya (@nprnishant) is NPR's Asia editor. He is in Taiwan on the East-West Center Asia Pacific Journalism Fellowship.